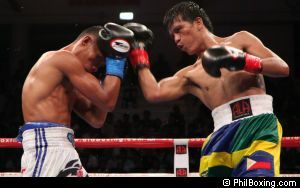 Hard-hitting Merlito 'Tiger' Sabillo who was recently elevated to full WBO minimum weight champion will make the first defense of his title on June 29 in Bacolod City against a top ten contender. ALA promotions president Michael Aldeguer is in negotiations with Mexican promoter “Tuto” Zabala Jr of All Star Boxing on a possible opponent but no details are available as yet. Sabillo won the interim title with a stunning 8th round TKO over fancied Luis De La Rosa of Colombia last March 9 in De La Rosa’s hometown. The undefeated southpaw who has a record of 21-0 with 11 knockouts is 29 years old but his career took an upward swing when he moved to the ALA Gym some four years ago. He was elevated to WBO champion when Mexico’s Moises Fuentes relinquished his title and moved up to light flyweight where he fought defending champion Donnie Nietes but failed in his bid yo wrest the title in a majority draw decision at the Waterfront Resort Hotel and Casino last March 2.